These are a collection of technical articles and quick-tips that we've picked up over the years. Send us an email if you'd like to see a specific topic added to the library. I hope to fill the following sections of our web site with little tidbits of technical how-to that we've picked up over the years. If you happen to spot something that is dead nuts wrong, drop me an email so that I can get it corrected. Likewise, if you have something you would like to have added, let me know and I'll see what I can do. Typical cast-iron Ford heads for the Mustang use a 14mm spark plug. The E7TE heads use a short (0.460") reach plug while the GT-40 and GT-40P heads use a long (0.708") reach plug. Both types are a tapered seat (no washer needed) plug with a 5/8" hex. I would typically run either a Motorcraft or Autolite plug. I try to stay away from Champion and your 'rob you blind' plugs such as the S%itfire plugs. For the Motorcraft and Autolite plugs, it basically holds true that the lower the number in a family of plugs, the colder the plug. Colder plugs are good for high performance applications as they wick the heat away from the electrode quicker. Hotter plugs are better for everyday driving and fuel economy. The colder plugs resist pre-ignition and electrode erosion better. Autolite recommends installing the plugs approximately 1/16th turn past finger tight or 7 to 15 ft-lbs. Autolite plugs come with full-thread or part-thread. The 10x series is full-thread while the 76x and 5xxx series are part-thread. Either will work with the Ford heads. Roller rockers are a simple bolt-on modification that will give your Mustang a boost in performance. Many people have problems getting the proper lifter preload when making the switch however. Here's an easy way to set the proper preload. Slowly tighten the pedestal bolt while gently rolling the pushrod between your thumb and fore-finger. At the first signs of drag on the spinning pushrod, stop tightening the pedestal bolt. This is the 'zero lash' position. Put your torque wrench on the bolt and note the wrench position (e.g. 12 o'clock, etc.). Now begin to torque the pedestal bolt. You should reach 18 ft-lbs of torque somewhere between one-quarter and three-quarters of a turn of the wrench (e.g. 3 o'clock to 9 o'clock if 12 o'clock was your starting point). This should give you about 0.040" to 0.060" preload in the lifter. If you didn't reach the specified torque by the time that you passed three-quarters of a turn, then the rocker needs to be shimmed. Start with a thin shim and work progressively thicker until your torquing fall in the range. If you reached the full torque in less than one-quarter turn, then the rocker needs to have shimming removed. If no shims were removed, then the rocker pedestal needs to have some material removed from the bottom surface. This can be done on a mill, or if you're careful, with a Dremel tool. The pedestal surface must be flat and square when you're finished though. For stud-mounted rockers, you're basically performing the same steps except that there is no shimming involved; after reaching zero lash, note the wrench position and continue tightening the 1/4 to 3/4 turn. Then lock down the poly-lock by holding the adjusting nut while heavily torquing the inner set screw. Stud-mounted rockers allow nearly infinite adjustment without the hassles of shimming. I tried to set my preload consistently between one-quarter and one-half turn. This helps keep the valve from hanging open too much when the lifter pumps up. I usually run the valves by rotating the engine clockwise until the exhaust lifter raises (exhaust valve opening) about 1/8th inch, then adjust the intake rocker. Then I continue rotating the engine until the intake valve opens and when it is within about 1/8th inch of being closed adjust the exhaust rocker. This process insures that the lifters are on the base circle of the cam when the rockers are adjusted. For the routing shown on the right, you'll have to disassemble your tensioner and reverse the spring operation in it so that its actually pulling UP on the belt. The thing I don't like about this option for a street-driven car is that it leaves a pretty small portion of the belt actually touching the water pump pulley which could cause slippage at high RPM or high load conditions. The preferred routing for a street car is shown on the left. The stock water pump is replaced with a water pump from a 1983 Mercury Cougar with a 302. This pump has the same exact dimensions as the stock pump, but has a normal rotation impeller to it. The pump cost about $18.95 at the local parts store without a core. With this arrangement, the tensioner doesn't need to be changed at all and still functions as designed by Ford. One thing to consider with this technique though is that the water pump pulley now rides on the ribbed side of the belt where it had previously ridden on the smooth side of the belt. This doesn't really cause a problem, but ASP does offer a grooved water pump pulley with their pulley sets that will keep the belt riding straight and true over all pulleys. I use this grooved pulley with my combination. My belt length with the ASP Race Pulley set was about 42.5 inches long. Need more traction out of your Steed? Try adjusting your pinion angle. As suspension gurus tell us, pinion angle is critical under hard launching conditions. 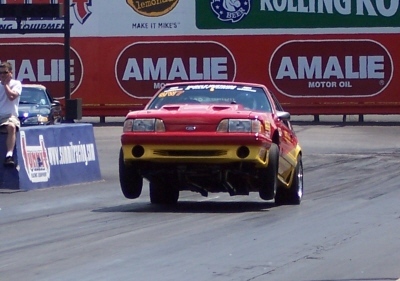 The action/reaction tendencies of the Mustang's pseudo four-link suspension creates a pretty significant amount of axle rotation under hard launches. As the tires bite, the pinion's reaction is to rotate upwards towards the pinion snubber. This tends to unload the tires and create wheel hop. The optimum power transfer would be if you could get your transmission, driveshaft and pinion to form a perfectly straight line as shown in the top figure. Unfortunately, with articulating suspension, varying ride heights and other geometric considerations its highly unlikely that you'll ever wind up with that perfect alignment. When I'd measure my geometry with Megabite Jrs. lower control arms and stock upper control arms, my car had the pinion pointing upwards 2.5 degrees and the driveshaft pointing upwards 1.5 degrees (both running uphill when looking from the back of the car forward). I've tried to show this in the middle drawing. Under hard launches, the pinion will have a tendency to rotate 3 to 4 degrees upwards which was leaving my pinion pointing to the sky (well almost). I tried to limit this somewhat with a Competition Engineering adjustable pinion snubber (see photo here) but the initial upward orientation still wasn't what I needed. So then I installed a set of Unlimited Performance's double-adjustable uppers (see photo here). The adjustable uppers allow you to shorten (or lengthen) the upper control arm, which changes the initial pinion angle. By shortening the UCA length, I was able to get the pinion pointing about 2.0 degrees downward with the driveshaft following it to about 2.0 upward. This provides a total difference between the two of about 4.0 degrees downward (negative) pinion angle. Under hard launches, if the pinion rotates 3 to 4 degrees upward, it should just about straighten the driveline for maximum bite and power transfer. So how do you measure the angles? I built four wood blocks of 2-by-12 lumber, two pieces thick by about 15 inches long. This way I can get the car far enough up in the air to crawl under and make the measurements and adjustments while still maintaining the normal ride height, weight distribution and driveline geometry. I bought a simple angle finder at Sears for about $10 that gives angles to the nearest 1/2 degree. To measure the driveshaft angle, simply place the angle finder on a straight and smooth portion of the driveshaft. To measure the pinion angle, I measure off the side of the pinion companion flange. There's enough flatness to the edge that if you're careful you can get a good read off the angle finder. Click here for an exploded view of the pinion and driveshaft measurement. If you have converted your rear suspension to all spherical bearings instead of rubber or poly bushings, the deflection under load is going to be much, much less. In this situation, you want to set your pinion angle as neutral as possible with the car at its normal ride height. Stuck with that huge early 90's starter on your small block Ford? Ever wondered if you could use the newer, smaller high-torque mini starters? Here's your answer to taking almost seven (7) pounds off your car, giving it easier starting, and giving yourself more clearance for that aftermarket exhaust system. Ford sells a high-torque mini starter that came on the 94 & up Mustangs (and 93 Cobra). This smaller diameter, higher torque starter usually runs around $139 plus about another $39 for the cable retrofit kit. The cable kit is needed since the mini starter is a two-wire starter versus the old one-wire system. I don't know about you, but I about gagged at the cost. So I went to a local parts store and picked up a remanufactured starter for about $89....half the cost. To handle the one-wire to two-wire transformation, just make the following changes. Move the large primary cable from the switched side of the solenoid to the 'always hot' side of the solenoid. In other words, the large cable running from the solenoid on the fender well to the starter should be place on the same pole of the solenoid as the large cable running to the batter. Make up a lighter gauge (I used 14 gauge) wire to run from the switched side of the solenoid down to the small terminal pole on the starter. Use a ring terminal at the solenoid end of the wire and what ever type of terminal is required at the starter end of the wire. MAKE SURE THAT THE TERMINAL ON THE STARTER END DOES NOT CONTACT THE PRIMARY CABLE OR TERMINAL. FAILURE TO DO SO WILL RESULT IN STARTER 'RUN ON' AND WILL RUIN BOTH THE STARTER AND THE FLYWHEEL/FLEXPLATE. Secure the new small wire to the primary cable with zip-ties, tape, or wire sheathing to protect it from moving parts and foreign object damage. And away you go. Three simples steps to a better starter for your SBF. Ever have the need to have the fuel pump run without the engine running? We all know that the fuel pump will run momentarily when the ignition key is first turned to the "ON" position, but sometimes you need or want to have the fuel pump run continuously for things like looking for leaks or draining the tank. The momentary circuit can be easily over-ridden to allow for continuous fuel pump operation by simply grounding one of the plugs in the EEC Test connector. The EEC Test connector is shown below [for my '90GT, the EEC Test connector is located on the driver's side shock tower between the shock tower and firewall]. The fuel pump lead (#97 tan & lt grn) is in the inverted T position on one end of the connector (the other T is empty). Ground the fuel pump lead to any convenient body or engine point and the fuel pump will run continuously when the key is in the "ON" position, until you remove the ground. I've made up a handy little ground wire that I keep in my toolbox specifically for doing this. On one end I have crimped a male flat spade terminal and on the other end I have attached an alligator clip. I insert the spade terminal into the fuel pump lead and attach the alligator clip to any nearby body bolt. Just be sure to remove your jumper wire when you're not specifically working on the system and always observe proper precautions when working on the fuel system. Refilling the T5 can be a harrowing experience because of the cramped quarters up in that hump. Here's a method that I've found to work pretty well. First, before draining the old fluid, make sure that you can loosen both the drain AND filler plugs (both are located on the passenger side of the transmission housing). Its a real pain in the %#$ to find that the fill plug is seized when you've already drained the old fluid. NOTE: Some people have tried to remove the large Torx-type fitting on the side of the casing mistakenly thinking it was the fill plug. DO NOT LOOSEN THIS TORX FITTING! Let me reiterate...DO NOT LOOSEN THIS TORX FITTING! This Torx fitting is the pivot pin for the reverse gear lever. If you remove this Torx fitting, you might as well go ahead and remove the entire transmission 'cause that's what it is going to take to fix your mistake. With the fill plug removed, remove the drain plug and catch the fluid in a large pan. Watch out, the transmission fluid is pretty thin and shoots a good distance. You can help the last few morsels of fluid drain by jacking (and supporting!) the driver's side of the car. Apply a little thread sealant (something like Permatex) to the drain plug and reinstall it. Torque the drain plug to 15-30 ft-lbs. DO NOT OVER TIGHTEN! The transmission housing is cast aluminum and can be cracked by over tightening the NPT threaded plug. Now you'll notice that the fill opening is in a pretty dastardly place to try and get a funnel or full bottle of fluid to. Go to your local do-it-yourself hardware store and pick up a drill operated pump and a washing machine fill hose (~$10 total). Cut the hose in half so that you have inlet and exit hoses for the pump. Pour 3-4 quarts of your favorite Automatic Transmission Fluid (Dextron type) into a clean, dry gallon milk jug. The transmission actually only takes 5.6 pints, but you'll need a little extra for priming the pump and those nasty little spills. DO NOT USE GEAR OIL. Gear oil is much too thick for the T5 and can cause damage to the synchronizers. Now jack and support the car from the passenger side. Crawl under and have your assistant (usually a wife or unsuspecting kid) hand you the exit hose from the pump. Insert into the fill hole and and kick the pump on. With a good pump and a 600 rpm or so drill, the entire contents of the jug are emptied into the transmission in about 60 seconds. Fill the transmission until a slight amount of overflow comes from the fill opening. Put your catch basin back in place and slowly lower the car from the jack stands. As the car is lowered, the fluid level is automatically set. Apply some thread sealant to the fill plug and reinstall. AGAIN, DO NOT OVER TIGHTEN! I've found this process to be much less frustrating than trying to worm a funnel and hose down from the engine compartment. I recommend trying Red Line Synthetic Dextron II or Mobile 1 Synthetic ATF fluids. I think they give much smoother shifts than your ordinary dino-oils. The EEC IV is a wondrous piece of engine management. However, along with computer control comes some pretty mystic maintenance. Any time the 'Check Engine' light comes on during normal operation, the computer is trying to tell you that something is amiss. Don't let it scare you though...it's not as tough as you may think. If you like to wrench on the 5.0 yourself, one of the best tools you can have in your tool chest is a scanner such as the Sunpro (I bought mine at Sears). It will help you easily diagnose engine related problems. A common problem indicated by the 'Check Engine' light is a fouled Exhaust Gas Re-circulation (EGR) valve. The EGR re-circulates exhaust gas back to the intake manifold for emissions purposes. Since it is redirecting hot, spent exhaust gases, it can become fouled over time, reducing its effectiveness. Over a long period of time, it can even become clogged to the point of inoperability. Disconnect the electrical connector on the valve. Disconnect the vacuum feed to the valve. Loosen and remove the 5/16" and 3/8" nuts attaching the valve to the spacer. Remove the valve and gasket. The valve can be cleaned using carburetor cleaner and a stiff brush. Be careful not to soak the valve completely with carburetor cleaner. This may damage the vacuum bladder and other phenolic components. Once cleaned, the valve can be reinstalled by reversing the removal steps. Re-torque the 5/16" nut to 12-18 foot pounds each. Clear the stored codes (be sure to write down all of them first! ), start and let the engine idle until operating temperature is reached, then give it a few 'Wide Open Throttle' (WOT) bursts. Shut down and recheck the codes. Your EGR problem should be solved! The late model 5.0 engines used exhaust gas re-circulation (EGR) to improve emissions performance. This involves taking exhaust gas flow from the exhaust ports and re-circulating it back into the intake air stream. The process of doing this has a couple of drawbacks for the performance minded individual. First off, it raises the temperature of the cooler intake charge as it is mixed with the re-circulated exhaust gas. Second, it fouls the intake runners with carbon deposits from the spent flow. And third, in routing the exhaust flow it heats the intake substantially, again killing the cooler, denser intake charge and robbing you of horsepower in the process. The only good thing the Ford engineers did in this scheme was spare us the re-circulating gas under wide open throttle (WOT). At WOT, the EGR valve closes, shutting off the flow of exhaust gas into the air intake stream. Pull the upper intake. Disconnect the intake tube at the throttle body and unhook the throttle cable by inserting a small screwdriver into the ball & spring lock and pry downwards. Unbolt the throttle linkage from the throttle body and set out of the way. Disconnect the EGR spacer coolant lines, the EGR vacuum line, and the two engine harness connectors. Remove the six upper intake bolts (2 are located under the decorative intake cover). Disconnect the four vacuum lines to the upper intake. Three are attached to the backside of the intake while one is attached to the front side. The upper intake should now lift off.....be careful not to damage the upper/lower intake gasket or either of the intake mating surfaces. You can now see the EGR ports located beside the #2 and #6 intake runners. Buy two 3/4" freeze plugs from the local auto boys. The 3/4" plugs are just a hair smaller than the EGR port, so I took a hacksaw and saw cut the freeze plug flange in a cross pattern so that it formed four tabs. Now by slightly expanding the tabs, the freeze plugs can be securely driven into the EGR port. I drove one into the lower manifold and one into the upper manifold, again being careful not to damage the surfaces. Put the upper manifold back on by reversing the order of step (1). Torque the main manifold bolts to 18-25 ft-lbs each. Now, the EGR spacer can be removed and replaced with an EGR spacer such as those offered by UPR Products. However, without the actual EGR valve in place to complete the computer's circuit, the EEC IV computer will repeatedly report EGR codes. If you're running an EEC modifying chip, you have have the EGR function shut off in the computer to solve this problem or you can simply leave the EGR spacer and valve in place and the computer will continue to open & close the valve even though there is no actual EGR flow. If you do leave the spacer in place, I recommend disconnecting the coolant circulation lines to the EGR spacer which will help keep things even cooler yet. Without the hot exhaust flow, they serve no purpose. Since the EGR doesn't flow at WOT, you won't actually pick up anything as you're barreling down the track. What you will notice is that while idling to and from the staging lanes, none of the EGR flow is present so your intake will stay cooler. All us Mustangers know that a cooler intake means a little more horsepower! These results really surprised me since the Explorer intake was completely 'as cast' which is REALLY rough in comparison to the smooth nature of the tubular GT-40. The difference isn't really that much, but there's an unwritten rule-of-thumb that the intake runners should flow AT LEAST 30CFM MORE THAN THE HEADS. Out-of-the-box GT-40P heads with stock components will flow around 185cfm on the intake side so neither intake really lives up to the rule; much less so for the better flowing GT-40P heads that we're running in Trophy Stock. I collected to following off the Windsor Power message board at the Mustang Works. The information was presented by one of the members (StreetStang37). I can't confirm, nor deny, it validity but it does make for some interesting reading. Presented along with these flow numbers was some additional text regarding gains made/lost on the dyno. The full story can be found by searching the Mustang Works archives. Likewise, the author also listed the following throttle bodies and their flow rates. with a smaller number cast underneath this in like 7E13. The second and third groups of four alphanumeric characters in the main number are really meaningless to the average person other than to know that the last set indicate the engineering revisions of the castings. The original engineering release of the casting begins with the "A" designation. 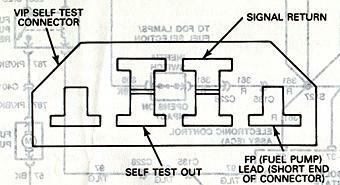 So in the example ID shown above, the important information is that this would be a block from the Ford Engine line with a casting design dating to 1983. For example, 7E13 = July 13, 1987 on an E series block. You may ask, "Why doesn't the year in the first casting ID always agree with the first digit in the smaller casting ID?" This will happen when the year of the actual casting engineering release doesn't correspond with the actual casting date. For example, the block casting can be engineered and released for production in 1984 and used continuously through 1987. Therefore the primary casting ID will read as "E4" while the secondary will read as a "7xxx". Now you know that when someone speaks of an E7TE head that they are referring to a Ford Truck head dating to the 1987 series of casting designs.